I know you are probably wondering why I’m writing about popsicles in the middle of winter in Colorado! Well, today was one of those beautiful sunny days where despite the lingering snow on the ground you almost forget that it’s winter. And with bulbs starting to break ground it really feels like spring is around the corner. 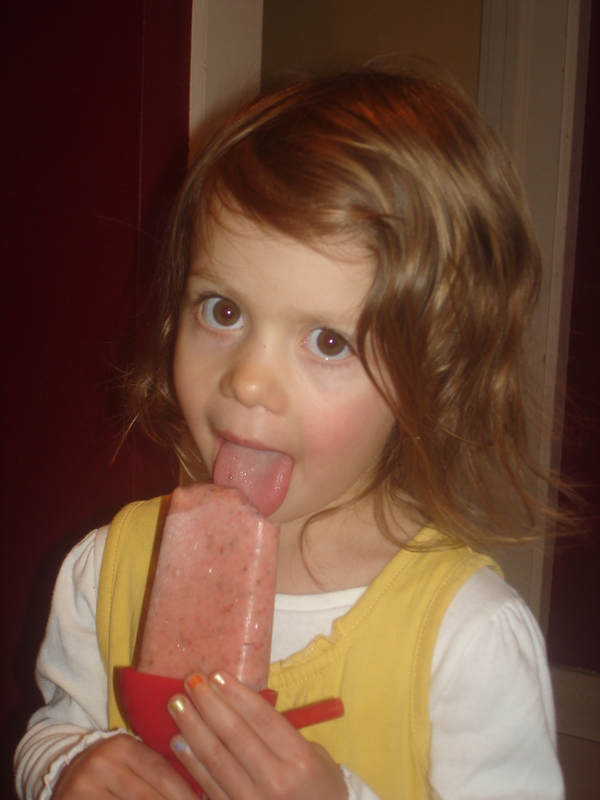 So in honor of this beautiful day, we decided to make smoothie popsicles, one of my daughter’s absolute favorite treats! Not only are they delicious, they are packed with nutrition! The fruit provides vitamin C and antioxidants to fend off those winter colds and potassium and fiber which most of us don’t get enough of. If you add plain yogurt you’ll get calcium to help with kids’ growing bones and probiotics which also help to boost immunity. Finally throw in a few chia seeds or ground flax seeds to boost omega 3 content. And voila, a nutritious and delicious treat anytime of year! If using flax seeds make sure to buy them pre-ground or grind in a coffee grinder so that you can absorb the omega 3 fatty acids. Place all ingredients in a blender and process until smooth. Pour into popsicle holders and top with lids. Place in freezer for at least 3 hours until frozen. Make a bunch and stockpile them in the freezer. Popsicle holders are available at Bed Bath and Beyond for about $5. Note: Look for organic produce and juice when available especially strawberries, peaches, blueberries and apple juice as these are among the dirty dozen, noted to have high levels of pesticides.